As sweet as cinnamon: Secret little things! another friend for her Birthday..
into a Wheat Bag for another dear friend Heather..
Hope it keeps you warm! Gorgeous Dawn!! Your little animals are so cute! and who wouldn't love a wheat bag. Oh so adorable. I love, love those pink and green fabrics in your piece! Makes me wish I still had them in my stash. I sold a ton of that in my shoppe when it came out. What sweetness in your sewing room, dear Dawn! Love love love the little birdies. Beautiful gifts you have sewn for friends. OH my goodness, these little owl and birds are the cutest thing!!! And I just have to ask... what is a wheat bag? 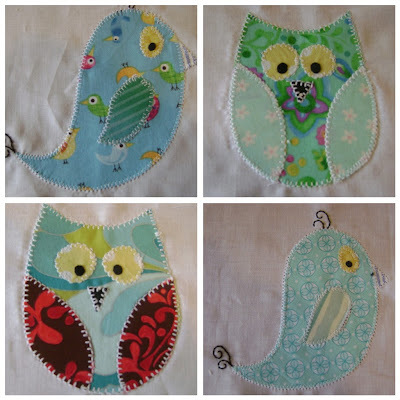 the birdies and owls are so cute - will make a beautiful little quilt. Cant go wrong with pink and green, and that looks gorgeous. Tudo muito bonito e delicado. Parabéns querida. Oh Dawnie - you always make the sweetest and prettiest things! Those little teasers are drop-dead-gawjus!!!! Those birdies are sweet and adorable indeed! Wonderful things coming out of your sewing room...love the fabrics...so pretty! Love the little owls Dawn!! I want to do an owl pillow for my grand daughter, they are so popular now a days aren't they! I love the fabric colours on your friends gifts too, very soft and feminine! She will love them! Gayle Manchin is into OSIRIS? Not so " secret" anymore! Those are cute aren't they. I made a couple too! Can't wait to see the finished quilts. Love the fabrics in the wheat bag!